These are shown larger than the real size so you can see the detail. Check the description for true size. art by Oxlock. Condition: NEW package of 12 bookplates made by pacaritambo books. The peel-off label stock is heavier than most bookplate materials and is matte and not glossy. They are as perfect as possible, and we feel the subject matter is much different than you can get anywhere else. 3.0" wide x 4.0" high. 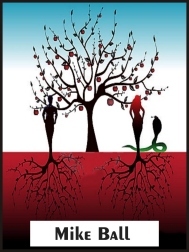 Content: One of the foundations for two major religions of the world, here are Adam and Eve under the "apple" tree taking root in the Garden of Eden - joined by, of course, the Serpent! We can personalize your bookplate (the font is Exotic350) - just email us the name. Any questions, click here to email us. art by Nem4A. Condition: NEW package of 12 bookplates made by pacaritambo books. The peel-off label stock is heavier than most bookplate materials and is matte and not glossy. They are as perfect as possible, and we feel the subject matter is much different than you can get anywhere else. 3.5" wide x 2.75" high. 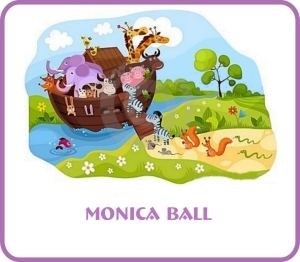 Content: Clever color rendering of a favorite Bible/Torah story of Noah, his Ark, and the great flood. Colorful animals boarding the Ark. 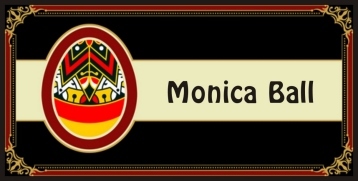 We can personalize your bookplate (the font is Davida Bd BT) - just email us the name. Any questions, click here to email us. art by Connie Larson. Condition: NEW package of 12 bookplates made by pacaritambo books. The peel-off label stock is heavier than most bookplate materials and is matte and not glossy. They are as perfect as possible, and we feel the subject matter is much different than you can get anywhere else. 3.75" wide x 3.25" high. 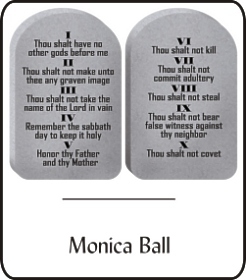 Content: The foundation for two major religions of the world, these stone tablets are in gray "marble" with black lettering. We can personalize your bookplate (the font is Lydian) - just email us the name. Any questions, click here to email us. art by unknown artist. Condition: NEW package of 12 bookplates made by pacaritambo books. The peel-off label stock is heavier than most bookplate materials and is matte and not glossy. They are as perfect as possible, and we feel the subject matter is much different than you can get anywhere else. 2.75" wide x 3.75" high. 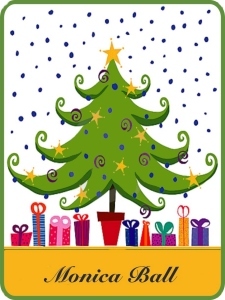 Content: Green Christmas Tree with yellow star decorations, Christmas pesents, and a green border - with room for a gift inscription, if you wish. We can personalize your bookplate (the font is Snell Blk BT) - just email us the name. Any questions, click here to email us. art by unknown artist. Condition: NEW package of 12 bookplates made by pacaritambo books. The peel-off label stock is heavier than most bookplate materials and is matte and not glossy. They are as perfect as possible, and we feel the subject matter is much different than you can get anywhere else. 3.0 wide x 4.0 high. 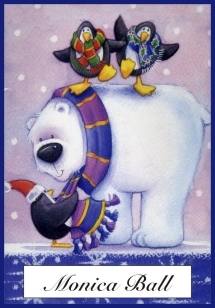 Content: Adorable polar bear cavorting with 3 little penguins decked out for winter and Christmas. 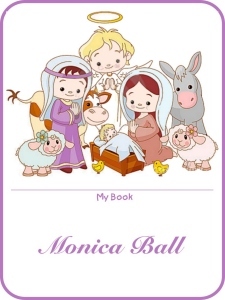 We can personalize your bookplate (the font is Davida Bd BT) - just email us the name. Any questions, click here to email us. art by unknown artist. Condition: NEW package of 12 bookplates made by pacaritambo books. The peel-off label stock is heavier than most bookplate materials and is matte and not glossy. They are as perfect as possible, and we feel the subject matter is much different than you can get anywhere else. 3.0 wide x 4.0 high. 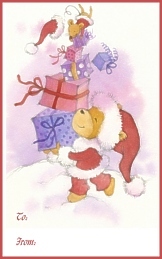 Content: Adorable Santa Bear balancing Christmas packages and a smaller Santa Bear. We can personalize your bookplate (the font is Snell Blk BT) - just email us the name. Any questions, click here to email us. art by unknown artist. Condition: NEW package of 12 bookplates made by pacaritambo books. The peel-off label stock is heavier than most bookplate materials and is matte and not glossy. They are as perfect as possible, and we feel the subject matter is much different than you can get anywhere else. 3.0 wide x 4.0 high. Content: Adorable Santa Bear balancing Christmas packages and a smaller Santa Bear. 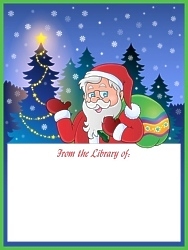 This version features a "To" and "From" text if the book (item) is a gift. We can personalize your bookplate (the font is Snell Blk BT) - just email us the name. Any questions, click here to email us. art by unknown artist. Condition: NEW package of 12 bookplates made by pacaritambo books. The peel-off label stock is heavier than most bookplate materials and is matte and not glossy. They are as perfect as possible, and we feel the subject matter is much different than you can get anywhere else. 3.0 wide x 4.0 high. Content: Santa Claus is delivering his Christmas packages in a forest with a lit Chritmas tree. We can personalize your bookplate (the font is Snell Blk BT) - just email us the name. Any questions, click here to email us. art by Irisangel. Condition: NEW package of 12 bookplates made by pacaritambo books. The peel-off label stock is heavier than most bookplate materials and is matte and not glossy. They are as perfect as possible, and we feel the subject matter is much different than you can get anywhere else. 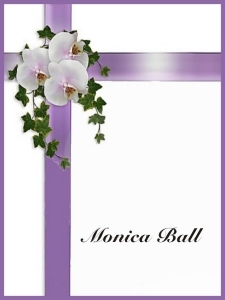 3.5 H x 3.0 W. Content: Beautiful purple "ribbon" cross with flowers (orchids?) and ivy. Perfect for religious holidays or just because it's pretty. We can personalize your bookplate (the font is Snell Blk BT) - just email us the name. Any questions, click here to email us. art by Irisangel. Condition: NEW package of 12 bookplates made by pacaritambo books. The peel-off label stock is heavier than most bookplate materials and is matte and not glossy. They are as perfect as possible, and we feel the subject matter is much different than you can get anywhere else. 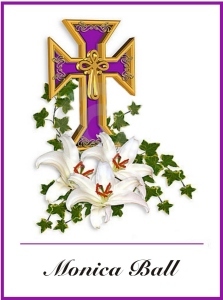 4.0 H x 3.0 W. Content: Beautiful purple and gold cross with lillies and ivy that could belong on any altar. We can personalize your bookplate (the font is Snell Blk BT) - just email us the name. Any questions, click here to email us. art by Ttinki. Condition: NEW package of 12 bookplates made by pacaritambo books. The peel-off label stock is heavier than most bookplate materials and is matte and not glossy. They are as perfect as possible, and we feel the subject matter is much different than you can get anywhere else. 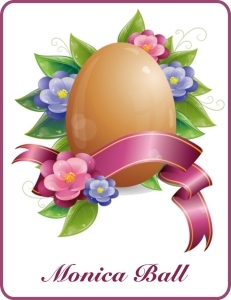 4.0 H x 3.0 W. Content: Adorable Easter Egg with blue and pink flowers and a pink ribbon perfect for your name. We can personalize your bookplate (the font is Snell Blk BT) - just email us the name. Any questions, click here to email us. art by Bobbyramone. Condition: NEW package of 12 bookplates made by pacaritambo books. The peel-off label stock is heavier than most bookplate materials and is matte and not glossy. They are as perfect as possible, and we feel the subject matter is much different than you can get anywhere else. 4.0 W x 2.0 H. Content: Euro-style decorated Easter Egg in black, gold, white and red. We can personalize your bookplate (the font is Hobbit) - just email us the name. Any questions, click here to email us. art by unknown artist. Condition: NEW package of 12 bookplates made by pacaritambo books. The peel-off label stock is heavier than most bookplate materials and is matte and not glossy. They are as perfect as possible, and we feel the subject matter is much different than you can get anywhere else. 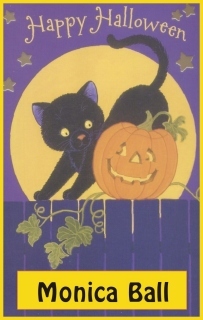 2.5" W x 4.0" H. Content: Black Cat with a pumpkin on a moon backdrop. Shades of purple backgrounds. We can personalize your bookplate (the font is Hobbit) - just email us the name. Any questions, click here to email us. art by T. Katz. Condition: NEW package of 12 bookplates made by pacaritambo books. The peel-off label stock is heavier than most bookplate materials and is matte and not glossy. They are as perfect as possible, and we feel the subject matter is much different than you can get anywhere else. 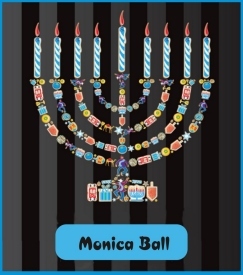 3.5 W x 3.5 H. Content: Brightly constructed menorah with symbols of the holiday on a black and gray striped background. We can personalize your bookplate (the font is CroissantD) - just email us the name. Any questions, click here to email us. art by unknown artist. Condition: NEW package of 12 bookplates made by pacaritambo books. The peel-off label stock is heavier than most bookplate materials and is matte and not glossy. They are as perfect as possible, and we feel the subject matter is much different than you can get anywhere else. 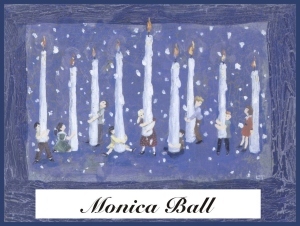 3.5 W x 3.5 H. Content: Children act as candle holders for white candles on this stylized menorah on a blue backdrop. We can personalize your bookplate (the font is Snell Blk BT) - just email us the name. Any questions, click here to email us. art by unknown artist. Condition: NEW package of 12 bookplates made by pacaritambo books. The peel-off label stock is heavier than most bookplate materials and is matte and not glossy. They are as perfect as possible, and we feel the subject matter is much different than you can get anywhere else. 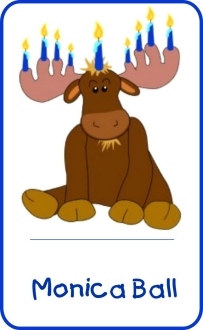 3.75 W x 4.0 H. Content: Adorable children's bookplate starring the Menorah Moose with his antlers holding the Hanukkah candles. Too cute. We can personalize your bookplate (the font is Kids) - just email us the name. Any questions, click here to email us. art by unknown artist. Condition: NEW package of 12 bookplates made by pacaritambo books. The peel-off label stock is heavier than most bookplate materials and is matte and not glossy. They are as perfect as possible, and we feel the subject matter is much different than you can get anywhere else. 3.5" wide x 2.5" high. 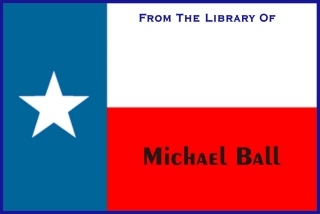 Content: Texas Flag in red, white and blue with the Lone Star of Texas. We can personalize your bookplate (the font is Enotc350 Bd BT) - just email us the name. Any questions, click here to email us. $ 4.00 + $ 2.85 first class shipping.